Rep. Mike Rogers greets Gen. John "Jay" Raymond at Tuesday's government affairs breakfast at the 33rd Space Symposium. Credit: Tom Kimmell. 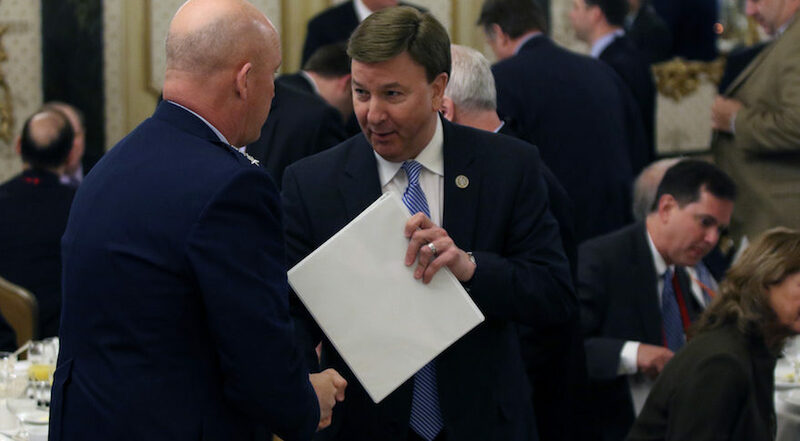 COLORADO SPRINGS – Rep. Mike Rogers said the U.S. Air Force needs a separate “Space Corps” to handle military operations in orbit, as a first step in creating a completely separate military branch. Rogers, chairman of the House Armed Services strategic forces subcommittee, said the Space Corps concept would be the first step in spinning off space operations into an independent branch of the military — similar to the way the U.S. Army Air Corps eventually become the Air Force. “My vision of the future is a separate space force within the Department of Defense,” Rogers said. Despite the Air Force being a “world-class military service,” space should not be led by people who “get up each morning thinking about fighters and bombers…you cannot organize, train, and equip in space the way you do a fighter squad,” Rogers said. The transition process will start to take shape “in my subcommittee’s mark this year and next,” he added, referring to a key step in the authorization committee’s legislative process. Rogers praised the likes of Gen. John “Jay” Raymond, leader of Air Force Space Command, and Lt. Gen. Sam Greaves, head of the Air Force Space and Missile Systems Center, but said the Air Force is not structured to educate and elevate a future generation of space leadership. Rogers said the Armed Services committee needs to begin debating the issue, but he does not expect radical change immediately.